ITV’s latest murder mystery series ‘Broadchurch’ wrapped up last night. I’ve fallen a bit out of step with a lot of drama series that are around now, I seem to miss an awful lot of them. That’s good in a way because it means there are an awful lot of them! This is much better than a few years ago when it was wall-to-wall reality TV across all channels. Good too because I remember growing up in the ’80s and ’90s, ITV used to be the leader in British-made drama and it is great to see they are really putting in an effort to reclaim that crown. A local perspective? 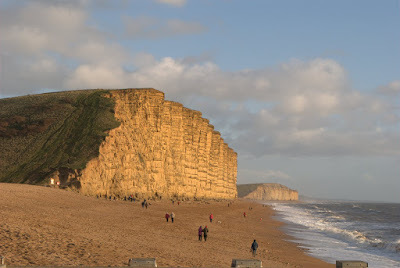 I live and grew up in the town ‘Broadchurch’ was filmed – or more accurately, in the adjacent town to where the seaside parts were filmed. 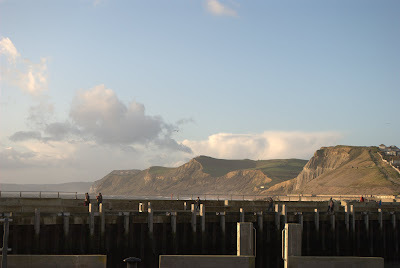 I live in Bridport, just two miles or so from West Bay, the site of the beach, cliffs, harbour and more. In other words the good bits! The town scenes, the hotel, newspaper, church and residential part too, weren’t filmed anywhere near here. I think they were done in Clevedon, near Bristol. I’ve no idea why. It was a shame really, there are plenty of places around here they could’ve used. We do get film crews now and again, Lyme Regis probably has had more, really though we aren’t used to a lot of attention. We’re on the border between TV regions so we rarely get any local news on our ‘local’ news bulletins. We’re used to be being ignored. ‘Broadchurch’ was pretty accurate in that regard! The last time the spotlight was on us was for Nick Berry’s ‘Harbour Lights‘ series in 1999/2000 (though it looks like the production values for that were firmly stuck in 1990! ), his project after leaving ‘Heartbeat’, which promised much in ratings and tourism and vastly under delivered at both. It generated a brief buzz then we plunged into obscurity again, the only legacy is a fish and chip hut now called Harbour Lights Fish Bar (it had a brief appearance in ‘Broadchurch’ under that name too, directly opposite the police station!). After that debacle I was amazed anyone here let film crews back in. It provides an interesting historical comparison though, as between the two shows a lot of development work happened at the pier and opposite it at what is now the filming location for Broadchurch Police Station. Once you get over the weirdness of seeing David Tennant, Olivia Colman and Pauline Quirke walking around a place you know well, you start picking holes in the geography (remember this was the first episode, too soon to have any relationship with the characters). Locations didn’t really match reality. In the opening scenes of episode one, Beth runs from a dual-carriageway into town all the way to the beach – yet the nearest such road is something like 4 or 5 miles away, and didn’t look like ‘our’ road.. I’m pretty sure I’ve seen it in Casualty! Obviously you can’t shut down the A35 to do some filming, it is a busy trunk road especially in summer, but still it seemed odd! They’d also walk or run from a place in West Bay to a place in Clevedon within minutes. The magic of television! These are only little niggles a local would know about, and quite honestly once the real drama got going I completely forgot about the lay of the land, I just imagined it was a fictional location with a few familiar places! The show was so good you just forgot about it. I liked the nod to Bridport & West Bay’s annual August torchlight procession, the writer is local so I assume that was deliberate. Every year the town comes together (well, those who can be bothered.. I’ve only done it once) to carry a lit torch – the firey kind not the flashlight kind – from Bridport to West Bay where it is thrown on a big bonfire by the beach literally yards from where it was in the show. The local community really got behind ‘Broadchurch’, especially the local newspaper The Bridport News, lots of local hotels and restaurants, cafe’s and so forth. They’ve been holding screenings as the series has gone out and there have been Broadchurch Echo posters in the newsagents! Maybe some tourists who saw the show might find it frustrating if they want to visit the sea then pop round the corner to visit the hotel or newspaper offices, and realise actually it is a little more difficult than that! So what is really here? The harbour, cliffs, beach, newsagent and the scout hall (really the Methodist Church), all these really are in West Bay. So is the Police Station (Streetview) although you might be surprised to learn it is a block of posh flats, a cafe and a bicycle shop. Jack’s house is near the East Cliff. Pauline Quirke’s character stayed in a caravan just a mile down the coast at Freshwater Caravan Park, Burton Bradstock. Be careful if you walk there, a lady died recently when the cliff subsided on to the beach. Anyway the clifftop walk between Burton and West Bay is nicer than the beach which is a bit too pebbly to walk on easily. The yellow hut? That’s a mile in the other direction at Eype (Streetview) – again take the Coast Path unless you really like the sea. Even better: walk one way to get there, walk the other way to get back! West Bay looked fantastic on TV, especially the golden cliffs and the inner harbour. Hopefully it’ll bring some grockles to fleece tourists to welcome. What isn’t here? The characters’ houses, the main street with the newspaper offices and the hotel – though the inside of the hotel isn’t a set, it is the real Bull Hotel in the centre of Bridport. I can’t quite see why they didn’t use the outside of it but there you are. A lot of the locals seemed to speak in Bristolian accents rather than Dorset. Obviously the town areas are filmed near Bristol, but writer is from here, the show mentions the town is in Dorset, I would’ve expected Dorset accents! What About The Actual Show? Truthfully, I had low expectations and wasn’t expecting to like it! I expected another Harbour Lights. I’m so pleased to be wrong, I really got caught up in this one and it kept you guessing. It was so well filmed and acted, properly good telly. The guessing came up perhaps half an episode too short – I wasn’t the only one to figure out who did it before the final episode even began. The writer made a bit of a fuss about the number of clues in the dialogue and the music. Perhaps if he hadn’t said that I might not have twigged. I think maybe there were a few too many clues. On the other hand, it was so well shot and acted that it almost didn’t matter, and since it kept turning on you, you weren’t really sure until the reveal – what if it was a set up to make us think it was him? You still wanted to let it play out. That’s the mark of a good drama. I enjoyed the examination of each character. Their flaws and histories. ‘Could it be them?’ Oh they have an alibi.. or so they say. It was a standout cast as well. I really thought this was going to be a vehicle for David Tennant, and yes he did feature prominently and did a great job with a twist on the well-trodden clichéd detective, but by no means was he the only star of the show. Jodie Whitaker (Beth) especially in the earlier episodes dealing with the grief – the whole family was good but she was excellent. Joe Sims (Nige) was very good. The standout throughout was Olivia Colman (DI Miller) who was on top form as her character took from happy local police, hardening to a murder detective, and especially in the finale – she’s not just an award-winning comedy actress but great at properly serious drama too. I didn’t really like Will Mellor’s character – no slight on him, it was refreshing to see him play something completely different after he seemed to get typecast as the ‘lad’-type – it was just that character didn’t seem to fit into place as well as the others. The pacing was very good and the shooting, they shot the landscapes beautifully. I liked how the two main cops didn’t like each other and for once in a TV show they never made up to become best buddies! The last episode.. wow. You might’ve guessed whodunnit but that reaction.. that was so raw, so real. The soundtrack seemed more like one of the recent Nordic Noir crime dramas than a British show and it was all the better for it, perhaps you wouldn’t be surprised to learn it was composed by the Icelandic musician Ólafur Arnalds. Second series? The last frame said, ‘Broadchurch Will Return’. How will that work? This isn’t like Wallander where they somehow got away with multiple murders in a small place, the focus there was on how it affected the detective. 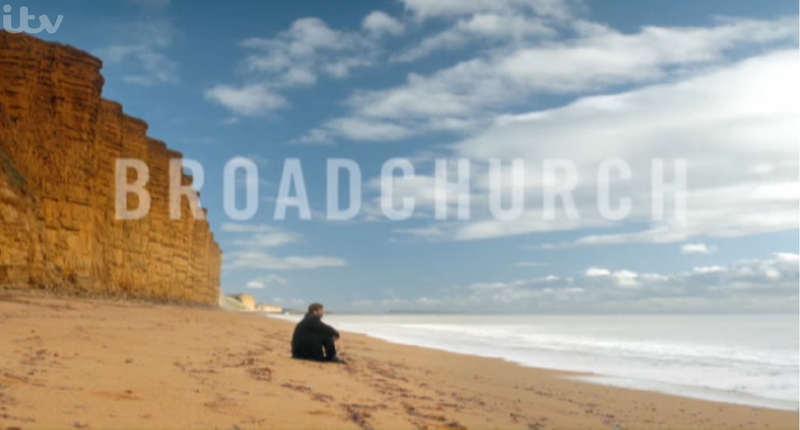 In Broadchurch the focus is on how it affected Broadchurch, the characters, the community, the town as a whole. You’d lose that effect if there was another murder so maybe it is a different kind of story? Or is it going to become a murder-per-series show? I wouldn’t be against that. I’d love to see a second series but I don’t see how they can do it justice. If you missed any of the last few episodes they should still be on ITV Player. The whole series is available on iTunes right now, and so is the soundtrack. US viewers will see it appear on BBC America some time this year. Well done ITV, well done to the writers and the cast, and everyone really! I hope I haven’t spoiled things too much. If you’ve seen it tell me what you thought about it, and if you haven’t seen it, why not? Forget preconceptions and find it and watch it.